This (7) RD 12 gauge shell carrier mounts to the side of the receiver on Mossberg 500 /590 model shotguns. 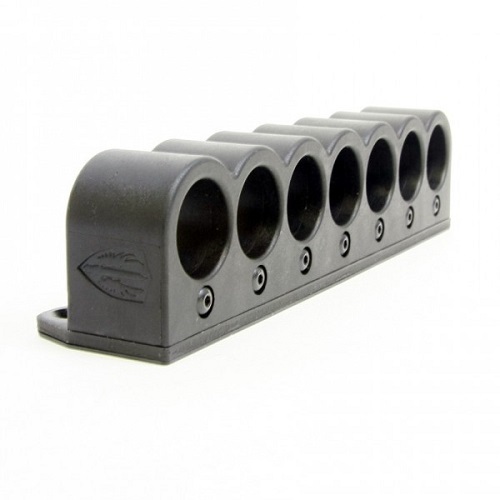 Precision molded polymer shell carrier and aluminum mounting plate securely hold 7 additional rounds for fast tactical reloads of the magazine tube. A patent pending retention adjustment system has been integrated, and can adjust individual tension for each shell allowing the user to fine tune the shell carrier for specific ammunition and the level of retention required. A rubber molded gasket fits between the mount and the receiver to protect the firearms finish. Shell carrier will not contact or interfere with the pump action forend when used with military length forends.